This was the concluding part of a PBI scenario we started earlier in the month. 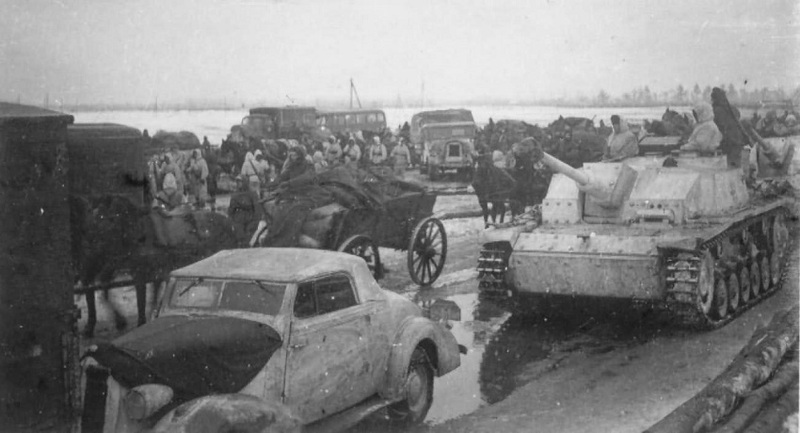 After a stumbling start, the Red Army paras and ski troops were reinforced with a column of tanks and some accompanying rifle sections. 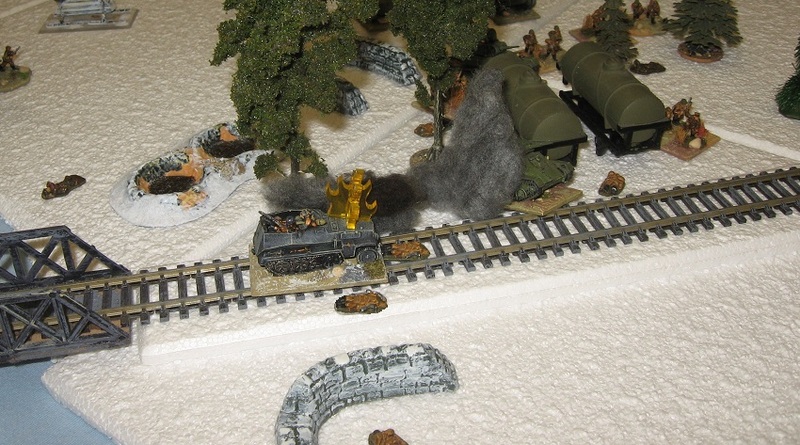 Although they had let the Russians take control of the mud road, the Germans were stubbornly dug in around the fuel dump in the woods, and had a platoon of scouts in half tracks plus some light armour just off table. Following the standard assets procedure (dicing for deviation), this went way off target and hit a section of paras (blue on blue) hiding in some adjacent trees. 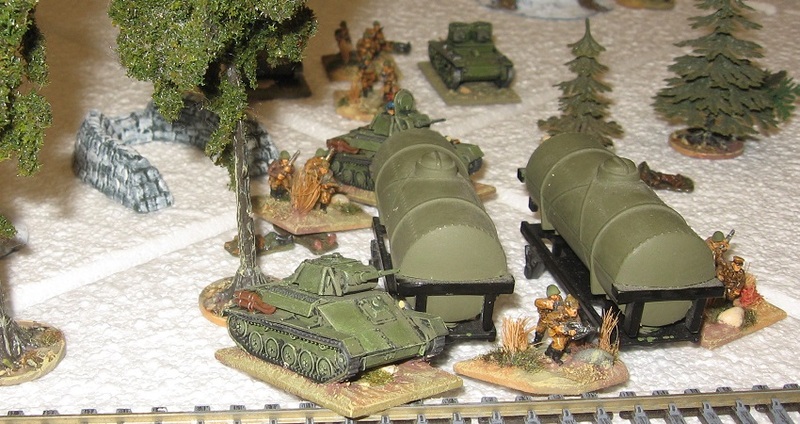 The Russians got their tanks quickly on table and rolled into the assault. After losses to preparatory shooting, the German position was left mostly being held by Officer bases (Platoon Commander, Company Commander), but with some effective use of the SMG, and closed terrain, they were able to bounce the first wave assault. Unfortunately, the German reinforcements just made it onto the table in time to see the second wave break over the position. Two hits killed the Officers (hits in the assault cannot be saved if foot groups) yielding the objective to the attackers. 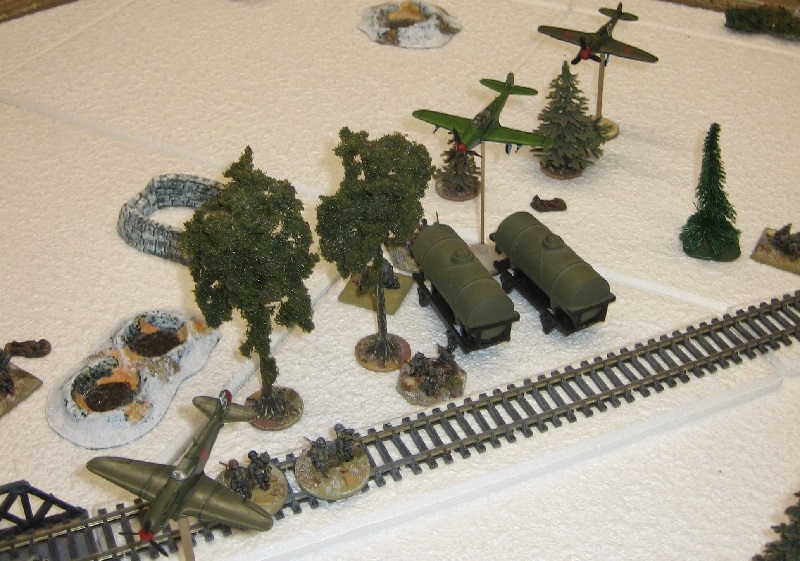 The Germans had put up a good fight, hanging on til the half tracks appeared. My new armoured car failed to dislodge some paras hunkered down around the road bridge, a flamethrowing half track missed, and the Platoon Commander’s carrier with a (Gun Effect 7) PzB rolled insufficient points to fire it – so sat staring at the rear ‘armour’ of an Aerosan. Hmm… All bad luck, but I guess the Russians would have described these as Winter Germans. These reverses let the Russians reorganise after their assaults, drop into defensible squares, and persuaded the Germans that they would have to pull out whatever they could salvage: the battle was over. Apologies that between the two parts, the battlefield and some of the figures changed … I left some boxes at HQ and had to improvise – but we were able to retain the core layout balance and starting positions. We had 4 players for this part of the game and played for around 2 hours which disappeared almost unnoticed (which is a credit to PBI and the snowy scenario) … it seemed to engage the players and had a good mix of content including some nail-biting combined assaults, some narrow escapes, some blue-on-blue and some big hits. Great game … I think I need to post a synopsis of where we are with PBI. Thanks, Motylos … I’m glad the visuals seem to work (we skimped a bit compared to Part 1 owing to the box I’d left at home). 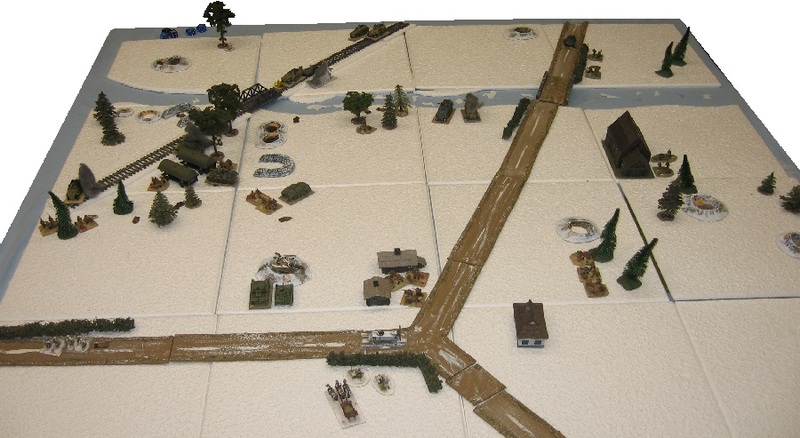 I did see a Battle of the Bulge scenario recently played without snow or ice (because the game’s the thing) – well to me the wargame is like a miniature theatre so set design can play a key role in enabling people to suspend their disbelief.